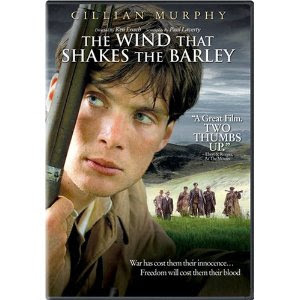 The Wind That Shakes the Barley DVD via Netflix. The Plot: 1920. Ireland is fighting for its independence from the United Kingdom. Damien, a young doctor, is set to leave Ireland to continue his medical studies. After witnessing several acts of brutality by the Black & Tans (the British soldiers sent to put down the rebellion), he joins his brother, Teddy, in the Irish Republican Army. After the 1922 Anglo Irish Treaty is announced, Teddy believes that some peace is better than continuing the fight and joins the pro-Treaty forces. Damien rejects the compromise of the Treaty and remains with the IRA. The Good: Well that was depressing. This acclaimed film about the beginnings of modern Irish independence, and the extreme bloodshed and violence that occur ed in Ireland in the 1920s, doesn't glorify anything or anyone. Oh, yes, the Black & Tans (see the Wikipedia entry as well as this newspaper article) are shown in all their awfulness. While the members of the IRA are fighting for their country, their language -- heck, the right to gather and play sports -- it's not innocent. The toll on Damien is shown, as he is confronted with having to shoot a man he has known since childhood because that man betrayed the IRA to the Black and Tans. That said, the movie does take a position: "get out of my country". While we see the execution of a traitor by the IRA, many of the people who worked on behalf of a free Ireland, such as the women in the Cumman na mBann, are portrayed admirably. What the movie explores very well is how it is not that simple -- "get out of my country" -- what does that mean, really? I loved that the how and why a group of regular men slowly become a discliplineddisciplined guerrilla unit is portrayed. How do you shift from a medical student to someone with a gun in your hand? The politics of the situation are tricky and complex; this film does a good job of conveying that complexity. There are several discussions, heated and passionate, that show conflicting opinions while conveying information. Actually? The discussions are just as exciting to watch as any shoot out. And edited and cut as carefully as any action sequence. It is action -- it is equally good people with a common goal (Free Ireland) with different views on how to get there. The DVD has commentary by the historical advisor to the film, Prof. Donal O'Driscoll. Beautiful movie. Terrific acting. About a time period and experience that many in the US know little or nothing about. But, be warned, depressing as hell. Because how can it not be? Sometimes history is depressing. How one group of people treats another? Especially when one group is in power over another? Isn't all puppies and daisies. And the legacy of that doesn't just go away on rainbows. I always loved the song of the same title...though the historical background is so tragic. The music in this film was gorgeous! And I could have done an entire post just on this song. I like Cillian Murphy. I discovered him in The Way We Live Now, the PBS mini-series (which is pretty damn good; its no Forsyte Saga, but still enjoyable).